FreshWater Watch is Earthwatch’s global project that engages members of the public in fun hands-on-activities in monitoring the health of their local water bodies. FreshWater Watch clearly highlights why citizen science matters, and an important reason is that it opens up science for everybody from corporate leaders to children, anyone, anywhere can help save the planet. The data collected by FreshWater Watchers in over 40 countries on six continents over the past six years have increased our understanding of the impacts of land management, urbanisation and climate change on freshwater ecosystems. We are using the data to inform better management and conservation of the world’s fresh water. We have helped targeted pollution prevention in Lincolnshire (U.K.), integrated water resources plans for irrigation in Central Java (Indonesia) and early warning for pollution in Sao Paolo and Curitiba (Brazil). 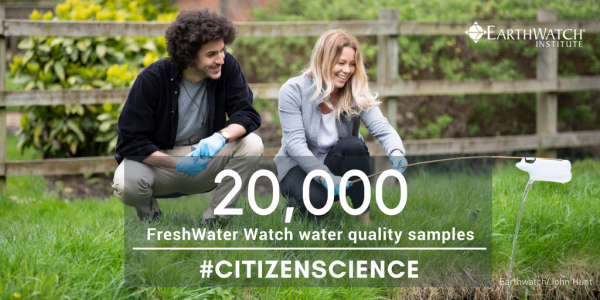 Our volunteers have helped us to reach 20,000 freshwater samples thanks to three Water Blitzes in April and May 2018, across Europe. Find out more about the water quality found in the Thames Valley (United Kingdom), Sörmland (Sweden) and Ravenna (Italy).